Assembled Twostep V1.1 board - Boards will be tested and programmed with the latest version of the Twostep firmware. 2x 4-pin polarized male headers - These headers can be used to connect stepper motors. 4x 3-pin polarized male headers - These headers can be used to connect endstop relays/switches/etc. 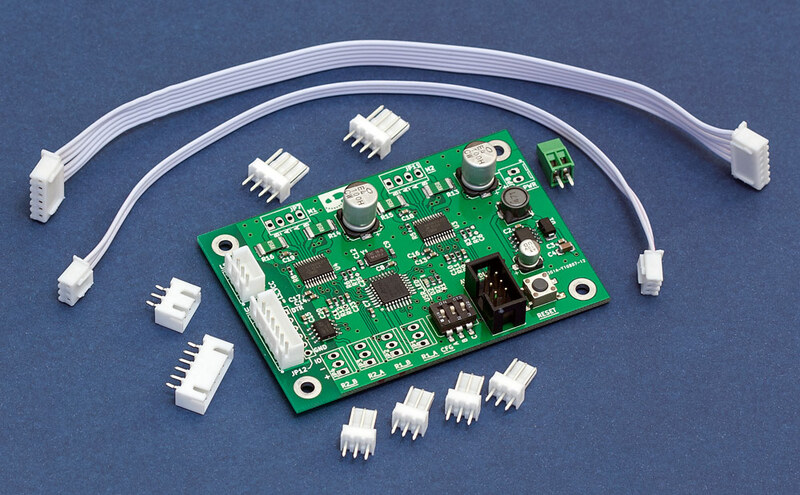 1x 2-pin wire-to-board connector - This can be used to connect power wires to the board. 1x 3-conductor 20cm cable - Can be used to power the isolated UART section of the Twostep board using a LaserShark unit. 1x 3-pin shrouded male header - Can be soldered onto a LaserShark unit in order to use the aformentioned 3-conductor cable. 1x 6-conductor 20cm cable - Can be used for data communications between the Twostep board and a LaserShark unit. 1x 6-pin shrouded male header - Can be soldered onto a LaserShark unit in order to use the aformentioned 6-conductor cable. Click the following button to purchase a TwoStep V1.1 Unit AND a LaserShark V2.1 Unit (save 5$)!